It never fails, where there is red wine, there are is always a white shirt begging for a splash. This has to be the most sought after solution when it comes to laundry help. Whether it is just a minor missed-sip, or a catastrophic bump at a crowded party....a red wine stain can be eliminated completely. The key to successful stain removal is in the speed at which you tackle the spill! 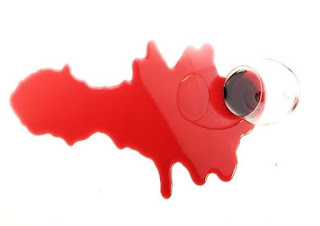 Depending on the location of the stain, there are various methods of removing red wine stains. Something as simple as boiling water poured over the fabric (if the fabric can tolerate hot water), can literally wash the stain away. Of course you would not be wearing the item at the time. First, if it is clothing, get it off and under the water (check care label) as quickly as possible. If not, quickly blot up as much of the wine as possible with a towel, before attempting to remove any remaining stain. Most importantly, never allow the stain to dry completely before treating! I read something a few years ago that said pouring white wine over a red wine spill would get rid of the stain, the theory being it would neutralize the stain. Honestly, I have never tried that one because it seems like an expensive route to take when there are plenty of other more economical alternatives. Blotting the stain with white vinegar for instance. Either way, it's not the best trick. If caught right away, plain old soda water has worked. If the item is not washable, like "dry-clean only", the best bet is to have it professionally cleaned. If you feel like taking the risk, you could try blotting the spot with a sponge dampened with a mild detergent, such as Woolite. If there is a ring around the stain, try feathering the edge of the ring with a cloth dampened with a little Shout, or similar type solution. Carefully applying a few drops of solution made up of one part ammonia or white vinegar, to two parts water, may help to lighten any remaining stain, then carefully flush with cold water. It can be extremely tricky working with non-washable fabrics. Carpets - Resolve spray is something I have used a lot and it has worked great. Another carpet cleaner called Spot Shot, comes in a can, actually works on clothes too. Tablecloths - Sprinkle small mound of salt over the stain right away, it will pull the wine out of the cloth and into the salt, then it can be brushed away! This is a great trick to try until you can take the tablecloth off the table to launder. Shaving cream can work on wine stains, but be careful because it works just like bleach and could harm colored fabrics. The same goes for hydrogen peroxide - but as with any treatment - always check an inconspicuous area of the fabric first for adverse reaction! <--- This is a product that removes red wine stains from many types of fabric and carpet without using bleach or phosphates. Just remember, time is of the essence! The longer you wait to tackle that stain, the harder it will be to remove.